San Francisco hotel workers learned yesterday, at a series of mass meetings attended by hundreds of union members, that UNITE HERE Local 2 has set a strike vote in two weeks -- on Thursday, August 24. Workers at most big hotels in the City will be asked to give the union leadership the right to call a strike if necessary. The strike vote was set after the union's negotiating committee unanimously called for the action. The union has been attempting, for over two years now, to negotiate a contract with the Multi-Employer Group (MEG), a cabal of thirteen of the City's biggest hotels. The call for the strike vote was met at yesterday's meetings with boisterous applause and cheers by a determined body of workers that has grown increasingly frustrated with the intransigence of the hotel bosses. San Francisco hotel workers do not find themselves alone in this fight. Last week, hotel workers in Toronto voted to give strike authority to their union leadership. And before Local 2 members vote, hotel workers in Chicago, Honolulu and Monterey will have held strike votes as well. There is a very real possibility that this battle will become national, if not continental, in scope. Two years ago, in October 2004, hotel workers at four MEG hotels went out on a limited, two-week strike, not long after their contract expired. The MEG responded by locking out workers at all the other MEG hotels, putting over 4,000 workers on the street. The lockout continued for nearly two months -- before loud, militant picket lines, several community mobilizations, and millions of dollars in lost business forced the bosses to put people back to work. Since then, hotel workers throughout the city have been working without a contract. In these two years, the multinational corporate empires that rule the hotel industry have made billions of dollars in profit. These corporate giants include Hilton, Hyatt, Holiday Inn, Starwood (The Palace, Westin St. Francis), and Intercontinental (Mark Hopkins). Starwood alone is projected to make nearly a billion dollars in profit this year. The San Francisco hotel union has been conducting a boycott of the MEG hotels which has cost them tens of millions -- but obviously not yet enough to force them to sign a fair contract. Local 2 has 12,000 members, mostly in San Francisco, but also in San Mateo County. Its members are overwhelming people of color -- many, if not most, immigrants. The heightened anti-immigrant agitation of the last few months, and the resultant mass movement of immigrant workers for justice and fair play, only adds fuel to the fire that may be coming. · Real wage increases for the next three years, and retroactive wage increases for the last two years. · Maintain comprehensive and affordable healthcare for all workers, families and retirees. 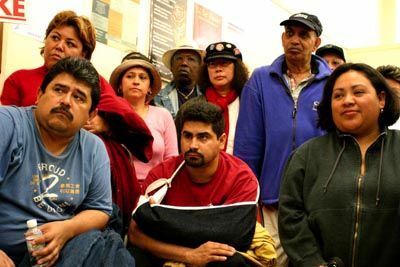 Currently, workers with Kaiser coverage pay $5 per doctor visit, and $10 per month for dependent coverage. The union has firmly rejected the MEG's proposals for a two-tier healthcare system. · Maintain adequate pensions for all workers -- a minimum of $30 per month for each year worked. That works out to the princely sum of $900 after 30 years of work. · Real workload reduction. There were huge layoffs after 9/11, resulting in significant speed-up that has not been fully reversed, despite the current boom in profits. In recent years, as well, many hotels have introduced "luxury" beds that are bigger, heavier and frillier -- causing a crisis in injuries and strain for maids. · Job security. The union will not accept the bosses' demand to have the option to sub-contract out work. Provisions to prevent workers from being fired when hotels are sold must be retained and strengthened. · The right to organize is key to keeping the union strong. The union is demanding the right to gain representation at new properties through card-check neutrality agreements, rather than being forced into National Labor Relations Board (NLRB) elections that are stacked against workers. There is no rocket science involved in this battle. The workers' demands are simple, just and necessary. The bosses have the bucks, and their greed is showing large. The struggle can be won, but it will require solidarity, then more solidarity, and finally, more solidarity. Is San Francisco still a union town? We shall see.